These would include laws targeting LGBTQ rights and “religious freedom” laws intended to give Christians a license to discriminate against women, LGBTQ people, racial minorities, and other religions. The ideology uses “efforts to restrict the space for religious pluralism in the country and give special privileges to a narrow segment of white Christians in America,” according to Rachel Laser, president of the nonpartisan Americans United for Separation of Church and State. “There is a strong movement to preserve white Christian power in America right now, and a real feeling of fragility about the changing demographics of America,” she said. The Trump administration has been particularly vocal about lifting up both Christian nationalism and white nationalism – the belief that America should be run and populated by only white people. Despite being decidedly un-Christian in his behavior, the President has unprecedented support among evangelicals and his staunchest defenders are often far right religious leaders and Christian hate groups. Nearly half of evangelicals answering the poll dismissed Christian nationalism as a concern. 47 percent of respondents found Christian nationalism to be “a critical or important threat.” 62 percent of registered Democrats thought it was dangerous, but only 35 percent of Republicans. 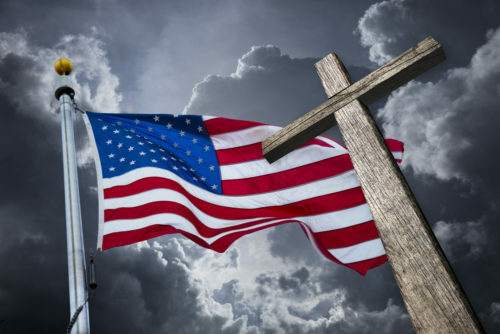 “Enshrined in this idea of Christian nationalism is that the true American is the white American,” Andrew Whitehead, an assistant professor in sociology at Clemson University, told Morning Consult. In a 2018 study conducted by Whitehead and colleagues found that those who identify with Christian nationalist viewpoints were the most likely to have voted for President Trump. “Trump will continue to position himself as the only person who can stop the assaults on Christianity,” he said. Democrats, on the other hand, have become enamored with presidential candidate Pete Buttigieg, the out gay mayor of South Bend, Indiana, who has been vocal about the importance of progressive Christians to stress their brand of the religion to blunt the influence of the far right in politics. “The idea that the only way a religious person could enter politics is through the religious right — I just don’t think that makes sense. What could be more different than the message I take from my faith and what we’re being shown in Washington right now?” Buttigieg said in an interview on Morning Joe. Morning Consult’s survey was conducted among 1,994 registered voters with a margin of error of 2 percentage points.